Where do old racing sailors go? They don’t just fade away. It’s been 39 years since Garry Hoyt won the Sunfish Worlds—a title he shares with John Kostecki, for one—and a lot of the time since was spent cooking up boat designs and systems to make sailing more accessible, more affordable, more popular. If the man is right, or even half right, we’re on the cusp of tremendous changes, and Hoyt’s new book wades right in. That book would be Go for the Green: The New Case for Sail & Solar Power. The heart of it is the author’s claim that the legacy of sail and the potential of sail are “of serious importance” and the future is ours to claim. 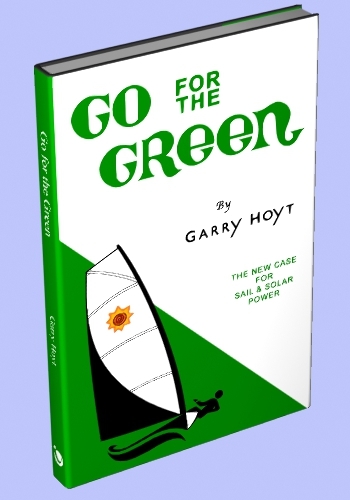 Being Garry Hoyt, he has notions about everything from sail training (must focus on soloing on day one) to rig configuration (must simplify) to how to create the next generation of motorsailer (must appeal to motorboaters). I guess you know I wouldn’t be writing unless I believed this slender volume is worth the read. Apparently this is a book review that I’m writing, or something akin to that, so I would be doing no service to the author to quote the text in full. I would say, rather, that he has a refreshing way of framing the basic physics of how boats sail, and many a developing sailor would benefit from that portion of the book alone. Developed sailors will already be familiar with some of the rig innovations that Hoyt explores—various combinations of free-standing masts, Hoyt jib booms, and offset rigs—though the combinations will be new, along with the explicit connection to the high cost of low-cost petroleum. 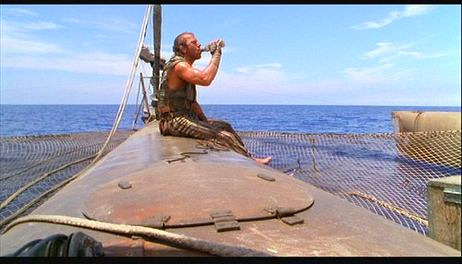 I suspect that Garry’s not expecting to see one of these on the water soon. For now, he’ll be happy if he can just inspire conversation. His sketches envision a cute, thirtyish-foot craft resembling more a motorboat than a sailing hull, with a freestanding rig and a square(ish) sail that folds into three panels, vertically or horizontally. I immediately envision wanting leeboards for reaching, but there goes simplicity, and this is no vision of future Olympic boats—Hoyt competed three times for Puerto Rico while assigned there as an advertising executive—but it conjures up a happier future on the water than anything we saw in ah, ah . . .
. . . the movie Waterworld ? A touch overwrought, that, but even if the future we’re trying to avoid is not so cataclysmic, I liked unhearing that electric car. Decades ago Hoyt wrote a book called Go for the Gold and suddenly the entire sporting world had a new catchphrase. Green is the new gold?